Whole-home Wi-Fi (or mesh Wi-Fi) systems are scalable solutions designed to improve Wi-Fi signal across your home. 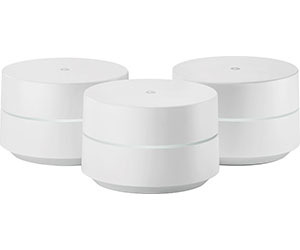 When obstructions, such as floors, doors, and walls (or even other Wi-Fi networks), interfere with the wireless signal in your home, a mesh Wi-Fi system can be used to allow expansion into areas that would otherwise have little to no signal. The modular systems are expandable by adding additional access points throughout your home. Corresponding apps allow for easy setup and help users identify areas with weak signal for optimal node placement.